Four U.S. troops were killed in eastern Afghanistan on Monday in what NATO’s International Security Assistance Force said was a roadside bombing, according to a senior U.S. official there. The deaths would raise the total of U.S. military fatalities in Afghanistan to 30 in July, the highest monthly toll since the United States launched Operation Enduring Freedom in Afghanistan in October 2001. The bombing comes amid an uptick in fighting across Afghanistan, where international forces and Afghan troops have been battling the Taliban. 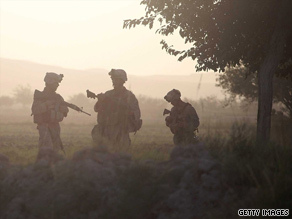 Part of the intensified fighting is due to a U.S.-led offensive in southern Afghanistan’s Helmand province, a Taliban stronghold and poppy-growing region. The forces are trying to gain and hold ground in the perilous region ahead of national elections this August. Last week, the total of international military fatalities in Afghanistan for July surpassed the previous record tally for one month. The previous mark was 46; counting Monday’s deaths, the total for July would be at least 56, a CNN count of official statistics shows. Monday’s deaths would put the number of U.S. troops who have died in Afghanistan since October 2001 at 659.